Friends of the IDF and Adath Israel celebrate 50 years since the Six-Day War. Photo credit: Ben Kelmer, courtesy of Nefesh B’Nefesh. Controversy over haredi military service roils Israeli society, but respect for each side’s concerns and values can help resolve it. Haredim believe Jews of all backgrounds are equally commanded to learn Torah. Israel could diffuse Torah study by allowing non-religious, non-essential soldiers to choose among several serious beit midrash programs for beginners with different traditional, non-coercive approaches to learning. Topics covered could include military ethics and the holiness of protecting the Jewish people and its land. For every hour a soldier learns, a yeshiva student would lend his abilities to the Israel Defense Forces (IDF) for an hour – checking an eruv, helping with kashrut and holiday observance, etc. Some haredi volunteers may prefer to relieve soldiers by repairing equipment, cleaning barracks, preparing meals, and performing clerical tasks. Haredi managers would supervise yeshiva students in all-male settings, with other accommodations when necessary. The program could coincide with bein hazmanim, when yeshivas are on break anyway. Yeshiva students will help spread Torah learning, and promote halachic observance on military bases. They will also gain useful experience for entering the work force, and have a ready answer for accusations of refusing to help protect the country. Non-religious soldiers will get time off after intensive training and duty, and some might find meaning and even inspiration in classical Jewish texts, especially those related to the military. Their morale will improve as responsibility for national defense becomes more equally distributed. Photo credit: Israel Defense Forces. IDF service and Jewish learning will be maintained or grow, and a wrenching national debate will begin to subside as very different Israelis gain exposure to other lifestyles without compromising their values. Because of mutual wariness, neither community is likely to embrace the proposal right away, but a pilot program involving those most open to adjusting could help work out the details and build trust. Accusing haredim of being lazy, unpatriotic ingrates has not facilitated solutions. But reminding haredim that their learning is no more meritorious than that of their less-educated brethren may actually gain their attention. The Torah praises the arrangement of two Israelite tribes: Issachar, who learned; and Zebulun, who provided for their needs. Halachically, an Issachar-Zebulun partnership offers each side the same heavenly reward. So far, only haredim have been Issachar. If Israelis switched roles on occasion, the entire nation would benefit from the twin virtues of duty and Torah. David Benkof is a freelance writer living in St. Louis. Follow him on Facebook, or E-mail him at [email protected]. Are Dirty Army Uniforms Appropriate for Prayer? Rabbi Joseph B. Soloveitchik was very meticulous and stringent in every phase of Hilchot Tefillah, the laws of prayer. He often cited the Rambam (Mishneh Torah, Hilchot Tefilah 5) that eight specific aspects of prayer should be adhered to while standing for Shemoneh Esrei (the central element in all Jewish prayer), the fourth of which is Tikun HaMalbushim, proper and dignified attire. IDF troop swearing-in ceremony. Photo by IDF. “If you will it, it is no dream,” Theodore Herzl wrote in his book The Old New Land in 1902. This phrase has inspired Jews from around the world to help make the Zionist endeavor a reality for more than a century. This proud tradition continues to this day. Currently, 6,000 volunteers from abroad are serving in the Israeli Defense Forces. Their official status is that of “lone soldiers,” because they leave their families behind and come to Israel alone. The Lone Soldier Center in Memory of Michael Levin aims to build a community and be a family to these soldiers when they are in Israel. In 2003, Michael Levin, Josh Flaster, and Ari Kalker sat around a table in Tel Aviv and shared fond memories of celebrating Shabbat at their Jewish summer camp in the U.S. They enjoyed telling about the delicious Shabbat dinners, and the special feeling that came over the camp as everyone sat around the table singing Shabbat songs. They imagined that their life in Israel as IDF soldiers would be a lot like that. Instead, as foreign volunteers, they found themselves very isolated. Israel is a very family-oriented society, and Levin, Flaster and Kalker did not have their families with them. As a result, when they were on a leave, they found themselves eating cold pitas with humus in an empty apartment for Shabbat dinner. Michael Levin was killed in action in 2006. The Center was founded in 2009. Through the Center’s work, Levin’s service and sacrifice are honored and memorialized, and his dream for lone soldiers to “never be alone” is realized. The most important mission of the center is to provide all lone soldiers with a welcoming community, which will care for them, guide them, and support them. The center has several offices, a website, and a Facebook page that serve as resources for lone soldiers. Shabbat dinners and holiday meals become festive occasions when hosted by the Center. Meals are held by in Jerusalem and Tel-Aviv. The Center has partnered with The Jerusalem Great Synagogue and The Tel Aviv International Synagogue to provide spaces for these meals. Volunteers lovingly organize these meals in order to create the celebratory occasions envisioned by Levin, Flaster and Kalker. Most lone soldiers arrive in Israel with few clothes and very little money. If they are not placed on a closed military base, they need to find an apartment with roommates. The Center helps match them up with other lone soldiers, and makes sure that they are signing a fair lease.Landlords in Israel are only required to provide a working cooking range, but not a refrigerator in an otherwise unfurnished apartment. The Center has a warehouse full of donated furniture and refrigerators that these soldiers may borrow. Volunteers drive the furniture to the apartments, and help carry the furniture inside. Every drafting lone soldier receives a donated package of clothing, food, and equipment that they will need to start their new life in Israel. Volunteers make sure that the army complies with all of its own rules and respects all of the lone soldiers’ special rights. Amharic-speaking Ethiopian-Israeli soldiers assist other Ethiopian recruits with navigating the army. An attorney volunteers to help soldiers who are finishing their military service understand their rights as new immigrants. Not all lone soldiers come from abroad. Young people who choose to leave Haredi families to enlist in the IDF are also classified as lone soldiers. These young adults grew up immersed in a Yiddish environment, as part of an orthodox Jewish community that rejects the modern secular culture, receiving no preparation to succeed in modern Israel. The Center tutors them in Hebrew, and prepares them for their high school equivalency test, . When a lone soldier is drafted or graduates from a course, all of the other soldiers have their families there to celebrate with them. The Center sends a person to every significant celebration to rejoice over every accomplishment with every lone soldier.The Center also organizes special social events for lone soldiers to enjoy during their free time. This helps lone soldiers make friends and connect with other volunteers from around the world. Florida: Coco Beach, Jacksonville and Tampa Bay. New York: Brooklyn, Long Island, Manhattan, Queens, Scarsdale and Westchester. Through this exciting initiative, individuals in cities across the continent will have the opportunity to raise awareness of lone soldier needs and support for the Center’s programming in their communities, schools and synagogues. The Center is a registered Israeli non-profit with 501(c) status. All money donated goes directly to benefit lone soldiers. For more information, or to inquire about establishing a chapter in your area, please contact the Center’s director, Josh Flaster. After a little over a month, I finally laid down my broom and graduated from basic training. The way the army marks the end of this swirly month is with our swearing-in ceremony. My plugah (company) and I stood in a blob formation while the company commander read a few sentences for us to repeat. Then, one by one, we were called up to hold a tanakh (bible) and our gun, and swear to uphold our duties to the IDF. The ceremony itself wasn’t anything special — the army has this funny way of throwing a bunch of random things together and expecting you to take it seriously just because it’s the army. This is the only explanation for the flashing light sticks scattered stunningly on the floor, the tree branches arranged in the shape of a Jewish star, or the old, cheesy music playing in the background. It all seemed very contrived to me, and as I stood at attention and watched my friends get called forward, I snickered to myself at the obvious symbolism that the commanders were forcing upon the occasion. And then my name was called. I took a deep breath and took a step up to my commander. He handed me my bible and my gun, and waited for me to say my part. All at once, eight years of dreams came flooding back to me. I saw myself at 10-years-old, standing at the Western Wall for the first time, feeling a holiness that I could not and still cannot explain, letting my most sincere words to God spill onto a ripped sheet of paper. I saw myself at 14, visiting my sister in Israel and finding that my longing to live here seemed to release me from my angst-filled and impatient adolescence. I saw myself at 16, frustrated with the knowledge that two years of wanting may as well be an eternity, sitting at a computer until the wee hours of the morning and Googling programs to finally bring me home. I saw myself at 17, enjoying my summer program but angry that I had to be a tourist in the land where my heart was born. And I saw myself at 18, cleaning the same chairs for the fourth time, doing push-ups, tears streaming down my face because the language barrier seemed impossible to break. 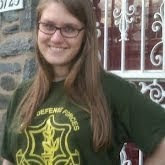 Becca Richman is a lone soldier volunteer with the IDF. She is the creator of It’s Always Sunny in Beit She’an: The Becca Richman Diaries.